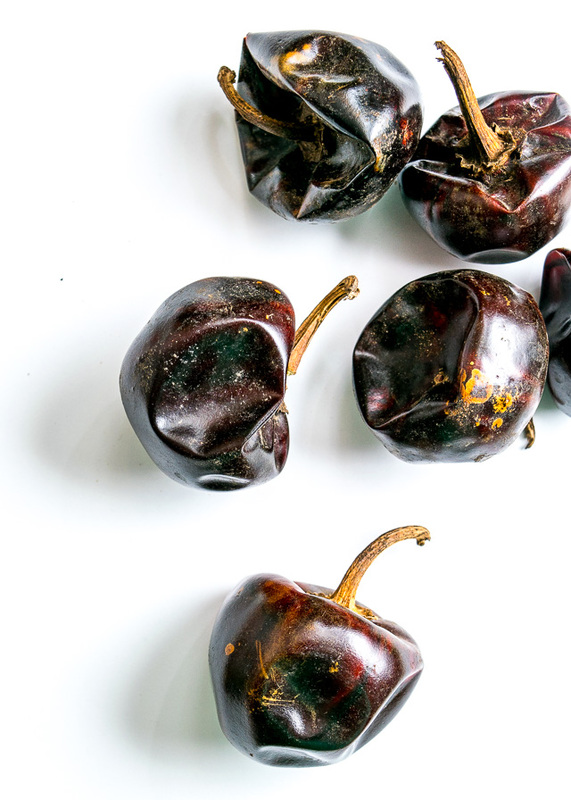 Cascabel Chiles are the quiet kid in the back of the classroom. Their smaller size and mild heat has kept them off most people’s radar. 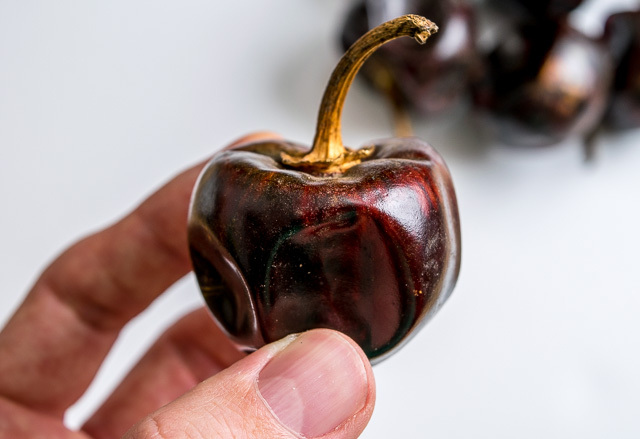 Named after the distinctive rattle their seeds make, Cascabels are typically paired with other, more robust chiles to make up for their perceived shortcomings. But Cascabels have a unique flavor that can easily stand up on its own when given the opportunity. Fruity and nutty undertones have created legions of fans devoted to this simpler flavor that somehow tastes of the Earth. 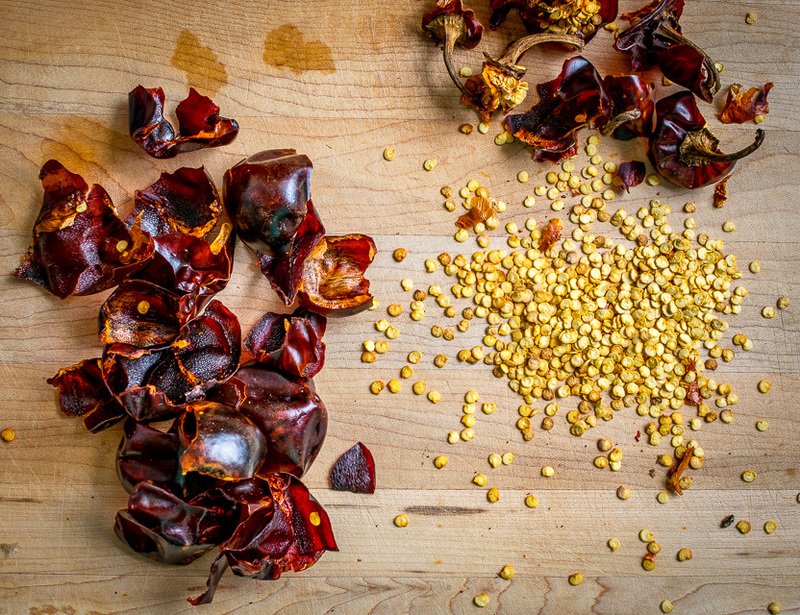 This particular Cascabel Chile Salsa limits the other ingredients so that the quiet kid can finally be heard loud and clear. Start by wiping off 7-8 Cascabels with a damp towel as there can be pockets of dirt in the surface folds. 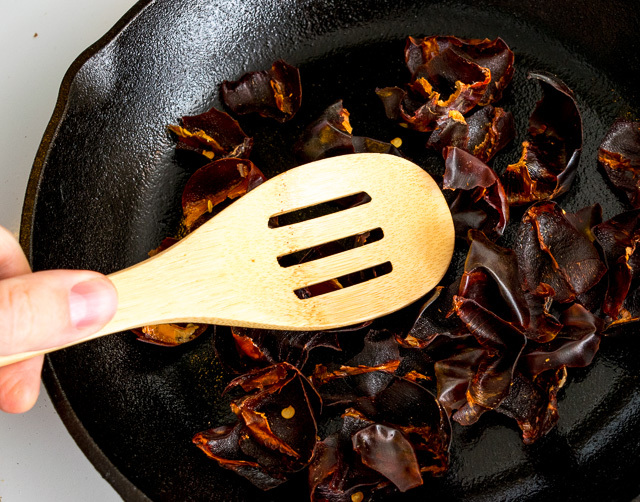 Tear each chile into 2-3 pieces and set aside the stems and seeds. Heat a comal or skillet on medium-low heat and press the chiles into the pan until they soften and begin to change color, about 1-2 minutes. This flash-heating wakens some flavors that lie dormant at room temperature. Cover with hot tap water in a bowl and soak for 10-20 minutes. If you have any floaters you can use a plate or small bowl to keep them submerged. While the chiles reconstitute, husk and rinse 2 tomatillos and roast them in the oven at 400F. They’ll be ready when they start to turn army green in about 10-15 minutes. 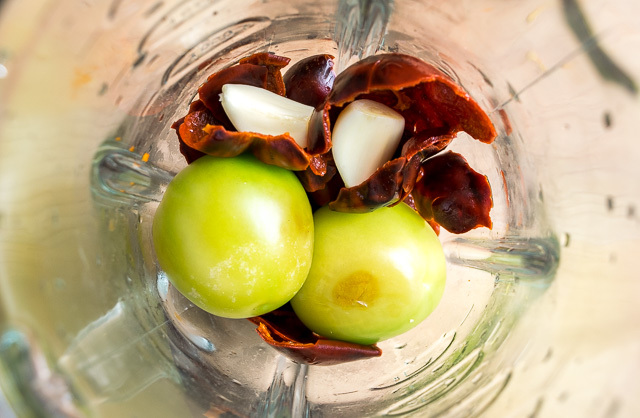 Add the tomatillos and Cascabels to a blender along with 2 peeled garlic cloves. Don’t worry about draining the Cascabels too thoroughly, you can just pick them up out of the soaking liquid. 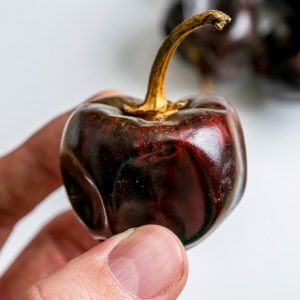 Add an additional 1/4 cup of soaking liquid that was used to reconstitute the chiles, along with a pinch of salt and 1/4 teaspoon of apple cider vinegar. Pulse blend and taste for seasoning. 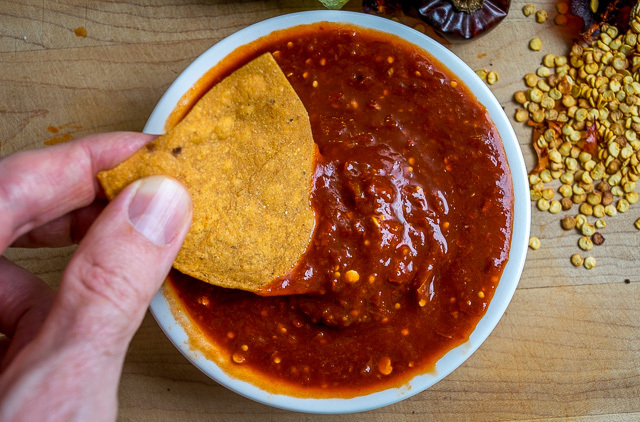 You’ll end up with a rich, delicious salsa that has a subtle and addictive flavor: slightly acidic with nutty undertones and ample heat. It can be used on just about anything, with a special nod to grilled meats and/or lazy afternoons centered around tortilla chips. You’ll find Cascabels in Hispanic markets and some gourmet grocers. Pick a few up next time you see them, it’s worth giving them a listen. 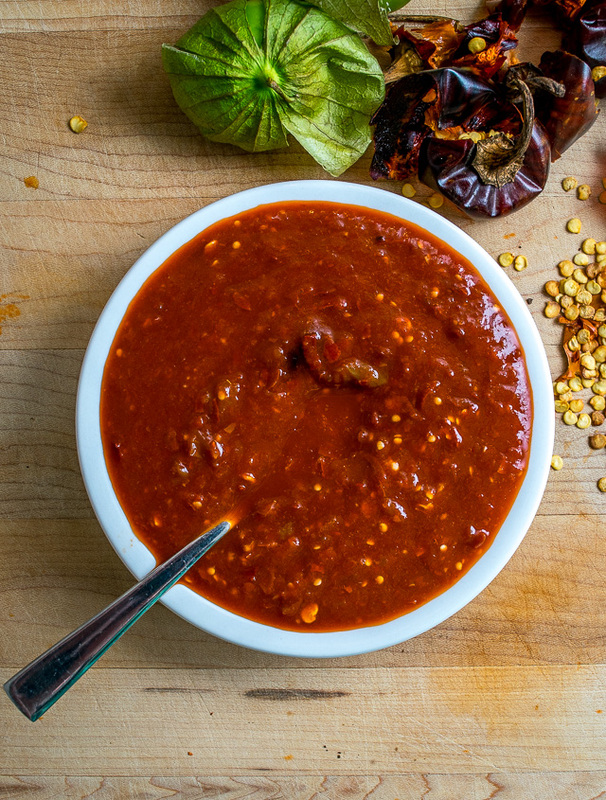 This salsa lets the Cascabels shine by omitting onions and limiting the number of tomatillos used. Using a comal or skillet on medium-low heat, cook the Cascabels until they soften and start to change color, about 1-2 minutes. Use a spatula to press them into the skillet. 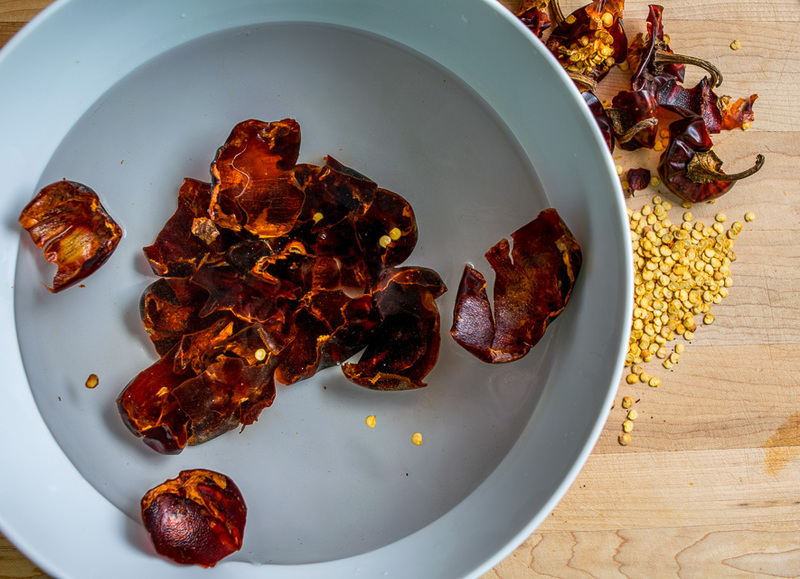 Place chiles in a bowl and cover with hot tap water. Submerge and let reconstitute for 10-20 minutes. 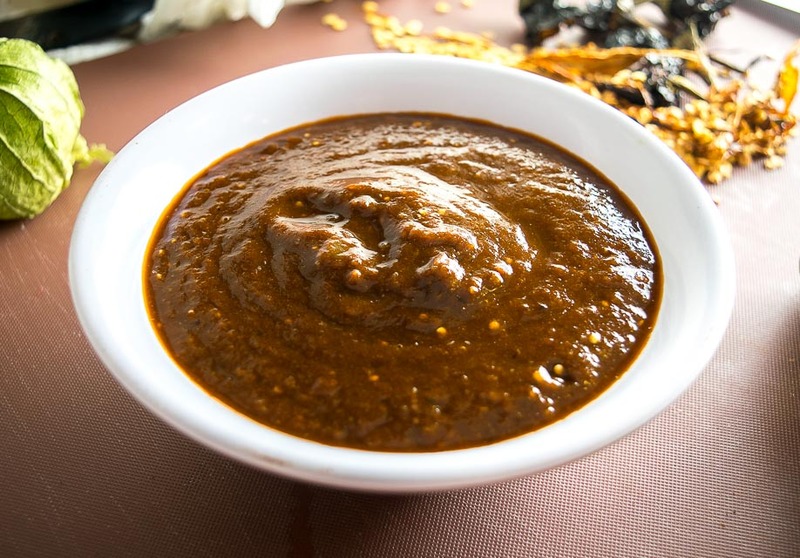 We use a similar recipe in this Pasilla Chile Salsa. Amazing!! I cannot wait to make this salsa this fall. I’m growing cascabels and tomatillos in my garden and should be harvesting them both over the next few months. I absolutely love the flavor of cascabels and they’re impossible to find where I live… so, I grow them myself! Thanks for a killer recipe. I found this on Tastespotting and so glad I stumbled on your blog! Cheers. Wonderful! I just made this and everyone is inhaling it. It’s mild, smoky, rich and unique. Thank you. It was not easy to find these peppers but fortunately I got them at a local Mexican grocery. They were in small packages of about 4 to 5 peppers. Thanks for the feedback Carolyn! It’s been a few months since I’ve had this salsa and I’m now officially craving it! Delicious! This is so different from all the dried pepper sauces I currently make. The look and consistency remind me of Valentina sauce. The taste is similar to Valentina sauce without the clove or allspice flavor. I had to run it through a mesh strainer as my inexpensive blender couldn’t deal with all the bits of skin. Great recipe Patrick! This is going on my tostadas tonight! Thanks David! Those Cascabels have a completely unique flavor don’t they? It’s been a couple months since I’ve had this salsa and now officially craving it! How long can this salsa be kept refrigerated? Hi Catherine! 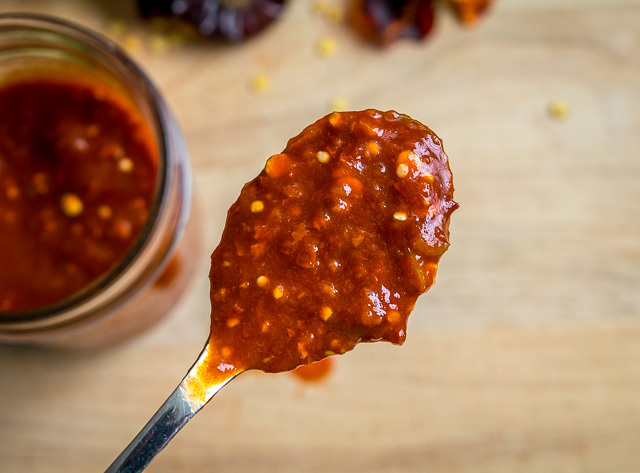 Like most salsas, it can be kept in the fridge for at least a week, but it will lose some of its zip after a day or two. Homemade salsa always seems superior to me when freshly blended so I’m in the habit of making smaller batches more often. Cheers. Surprised at the seeds in finished product after reading instruct #2. Is the temp spicy dependant on added seeds? Will save recipe and try. Hey Mike! I usually remove the majority of the seeds but there are always a few stragglers left behind. I don’t think the final temp will depend too much on how many of these stragglers are in the final Salsa as you’ll be getting ample heat from the chili pieces. Cheers.